Engine 49-1 is a 2003 Pierce Dash custom pumper. 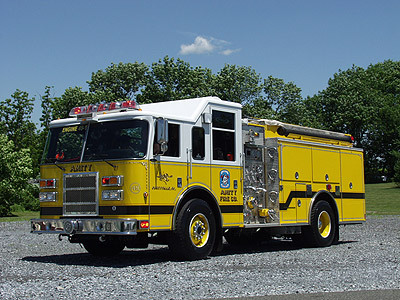 This unit is equipped with a 1250 gpm pump, 1500-gallon water tank and three 10" dump valves. The engine carries 1200ft of 5" supply hose, 600ft. of 3" supply hose, 2-200ft. 1 3/4" preconnected hoses, and 1 -150ft. 2 1/2" preconnected hose. This engine is also equipped with various supplies including 30ft. of 6" hard suction hose, for drafting out of streams, ponds, or rivers to supply a fire scene. The engine is equipped with 40' of ground ladders and misc. medical equipment. This apparatus runs second out on all structure fire calls and is part if the Southeastern Berks Tanker Task Force. * E49-1 is AED equipped.